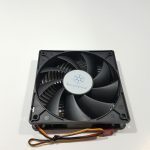 Swiftech is a well-known name in the water cooling community and market alike. 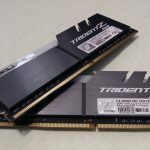 Founded in 1994 and incorporated in 2001, they had a great success with their first heat sink series under MC370 line and there was no stopping ever since to them n bringing the top-notch quality products in the mainstream market for the thermal management solution. 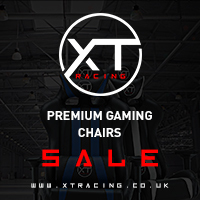 Their dedication to commitment, continuous innovation, listening to the feedback and no compromise on the quality and performance has seen them launching award-winning products backed by customer satisfaction. 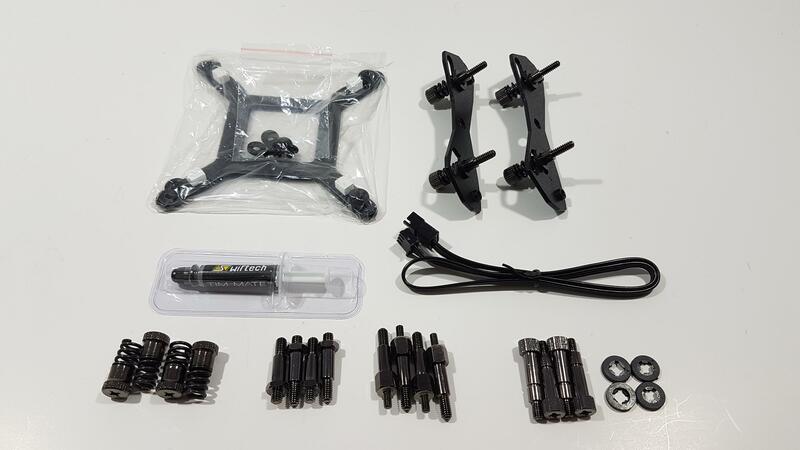 Their product range includes the pre-assembled water cooling kit (AIO), Reservoir, Pumps, Water Blocks, Fittings, Radiators, Fans, and accessories etc. 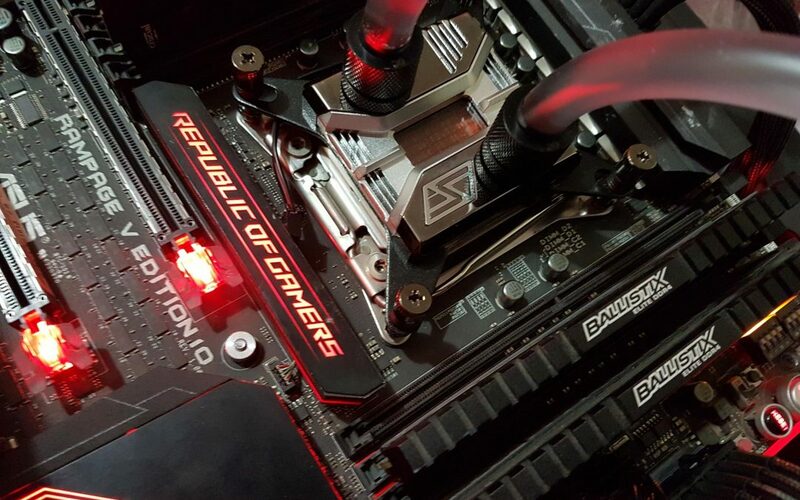 Particularly their AIOs are ever popular among the water cooling users as they are using the open loop components off the shelf in assembling the kit like integrated reservoir/pump combo mounted on the radiator, apogee water block to name a few of the components. 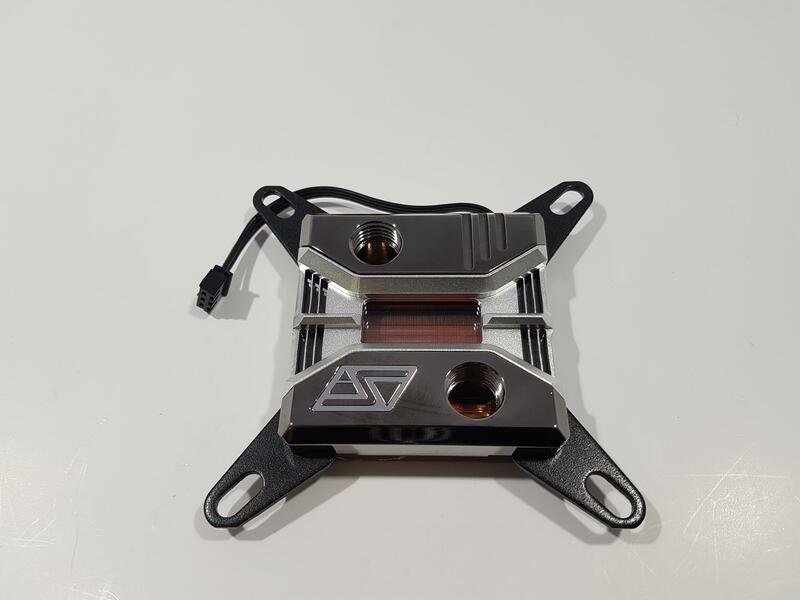 Swiftech has sent us their Apogee SKF Prestige CPU Water Block and D5 Maelstrom X100 Pump/Reservoir combo for the review. 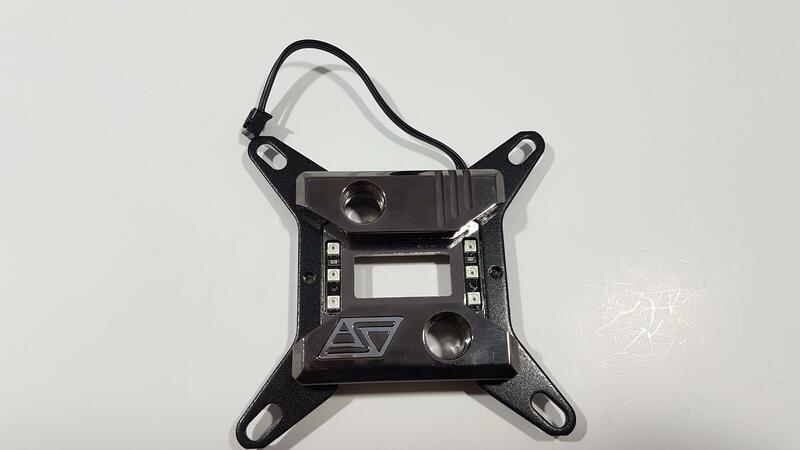 Today, I will be taking a look at their Apogee SKF Prestige CPU Water Block. Apogee is read as ap.o.gee meaning, the farthest or highest point; the apex; a final climactic stage. The distinct difference between standard Apogee SKF and Apogee SKF Prestige is that later is constructed out of black chrome plated brass body with a silver center cover and chrome Swiftech logo. Resultantly, this block is quite heavy. The standard SKF is made out of acetal plastic in black color. The Apogee SKF Prestige is using their most advanced cooling engine till this date comprising of a single copper block with 125 micron thick slotted fins. Just to give you an idea of what we are talking about here this 125-micron thickness is actually less than 5 thousandth’s of an inch! 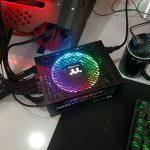 The SKF series from Heirloom generation is a limited edition run from Swiftech with some customer winning customization in the 5 colors for the Top, Cover Plate, and the Logo, Same goes for the mounting bracket which is made of aluminum but only in two colors. Being a limited edition, there is a block number (out of total production units) printed on the side of the block. Our Prestige sample is an exception to that as only Heirloom SKF series is offered in the limited edition with top-notch customization. This is not all as this block as two addressable LED strips on it with each strip having 3 LEDs on it. 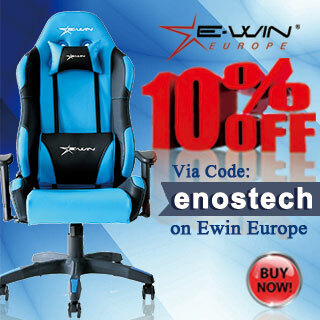 This can be used in conjunction with withSwiftech’s Addressable RGB Iris Technology. Please, note that you would need Iris-Eco hub/controller for this purpose which is sold separately for SKF and SKF Prestige line. The block is shipped inside a black color cardboard box. The box has a minimalistic design approach. The top side has Swiftech brand logo and name printed on its left side. Rest of the surface is without any printed material. The front side from where the box is opened has a sticker pasted on it. 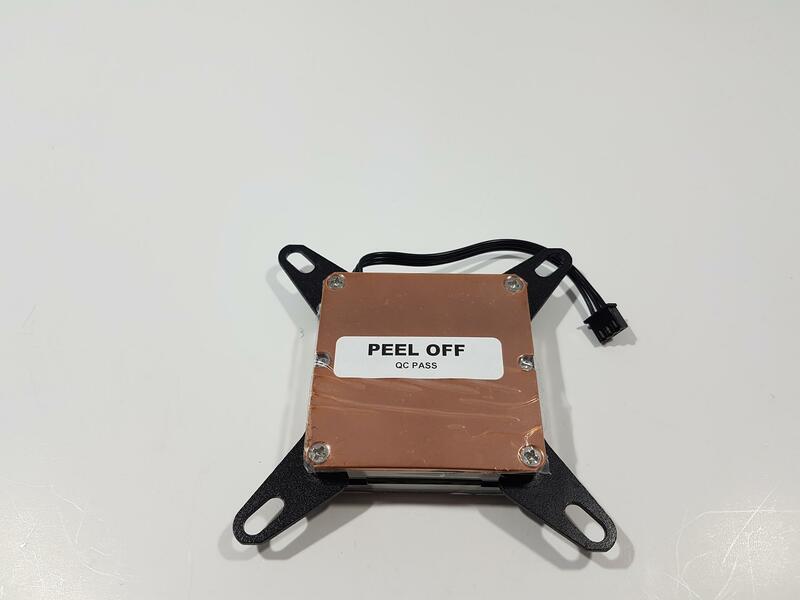 Swiftech brand logo and name are printed on the top left of this sticker followed by the model of the block which is Apogee SKF Prestige and CPU Water Block. Serial No barcode is printed on the right side. Rest of the sides are blank and don’t have any printing on them. Once the box was opened we saw black color Styrofoam pads placed on all the sides of the box and on the top covering the contents. This is for safe shipping and handling of the box with the contents inside. The block comes wrapped in a protective sheet on the top and at the bottom. This whole block is made out of the black chrome plated brass body having a silver color middle. 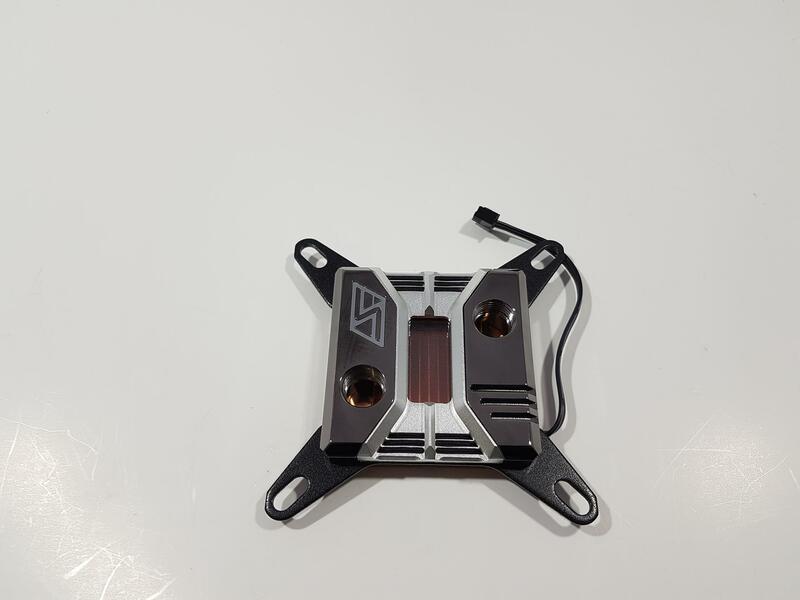 The Swiftech logo is also chrome finished to give a bold and well color coordinated look and feel to it. The top side has an inset in the middle. This section has a silver color frame with windowed (Transparent) central portion. This transparent portion is made of acrylic and it is showing the micro fins stack underneath it. This really gives that good look in person which may be hard to explain in writing. Hats off to their design team for such a brilliant idea with superb execution. If you would take a careful look at the silver color frame on its extreme sides, there are cutouts. This is for a reason that each of the sides has addressable RGB LEDs underneath it. The lighting effect is actually coming out of these cutout portions. The central portion is fixed to the block’s mainframe using two small threaded screws from the backside. We removed these screws to take off the silver frame. The plexiglass is running in full length under the silver frame is cut to the size for symmetry and added strength. The finishing and machining work is top notch, to say the least. Each side has two addressable RGB LED strips under it with each strip having 3 LEDs in a row. Being addressable ones, they are using the 3-pin format. There is a small length cable coming out from one strip side and it seems like both strips are connected to each other internally. The left and right sides of the block on the top have raised surface area and have a black color brass top in excellent finishing. The left sidebar has three cutouts on the top and a BSP G1/4” threaded port for the fitting at the bottom. The right sidebar has a similar G1/4” port on the top and a chrome finished Swiftech logo at the bottom. 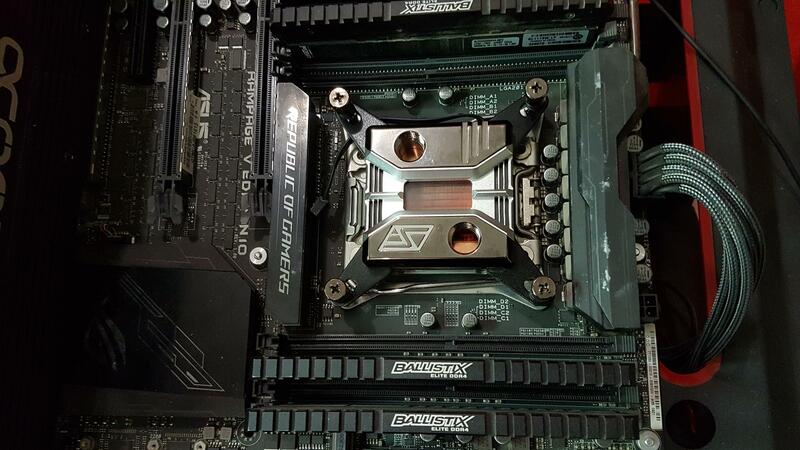 Both ports are implemented in a diagonal manner not in a parallel design as later is the most common design being used on the CPU Water Blocks. If you are wondering about no In and Out labels on the port then be it known that Swiftech is not using specific Inlet and an outlet port on this block. Given the diagonal design, there is enough spacing for these ports to accommodate the large size fittings on them. This is for a reason that we will explore shortly when we will take a look at the bottom inside of the block. For now, to answer the curiosity, there is no split stream mechanism in this block. Water will enter from one port and exit from the other port. Hence, any port can be used for Inlet/Outlet. The color of the text and symbols in the Swiftech logo matches with the color of the frame with a color of the logo’s frame in chrome. Both BSP G1/4” ports are nicely threaded and machining work is done in high quality. The block comes pre-installed with two mounting brackets. The mounting brackets are removable. The finishing of the brackets is good and we did not observe any particular thing to mention here. There are large size cutouts on each arm of these brackets through which the screws will pass when installing the block on the CPU. Looking at the side of the block, we can see the rather larger depth on each side above and below the mounting brackets. The angular borders of the frame are making the overall look and feel exceptionally good. Given the sheer size of the block itself, the cold plate appears tiny. According to our calculation, the dimension of the block without mounting brackets is 58x58x16mm. The 3-pin LED cable coming out of the block has approximately 100mm length. This 3-pin cable out of the box is not compatible with the addressable RGB headers on the enabled motherboards. Also, the provided cable in the box is the extension cable and still can’t be used standalone with the enabled motherboards. 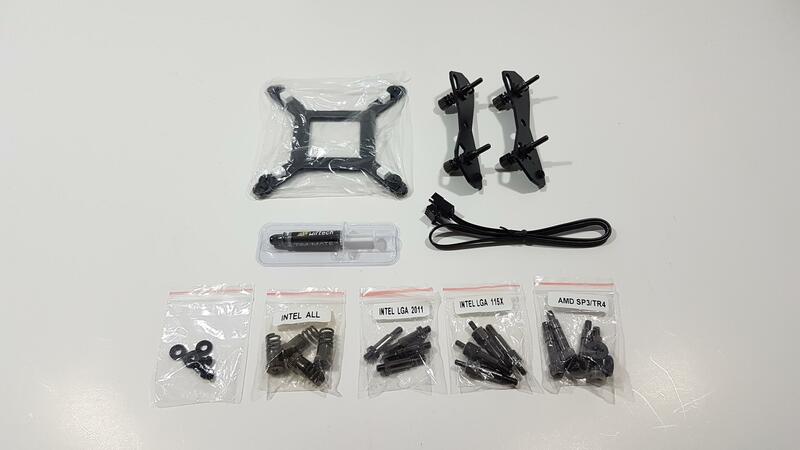 You would need Swiftech Iris Eco controller hub for this purpose which in my opinion should have been included given the price range of this block. We have tried custom addressable LED controller to try our luck but it was of no use giving us the impression that either these LEDs will only work with Iris Technology or they may be faulty though we are prone towards compatibility issue over faulty LED. Also, note the side with addressable RGB LEDs, the acrylic panes are also visible for more vivid lighting effect coming out of the block. Now that we have taken a look at the top and the sides of the block, it is time to see the base and the inside of the block. The base comes fully covered with the transparent sheet. There is a white color sticker pasted over that sheet telling the user to peel off the protective sheet. QC Passed is also printed below the warning text. We have four main screws that are securing the copper base with the block itself. We can spot two half circled cutouts in the middle of the left and right sides with small head screws visible inside. These two screws are securing the silver frame and acrylic on the top side of the block. If you would want to take off the silver frame and acrylic only then just remove these two screws. 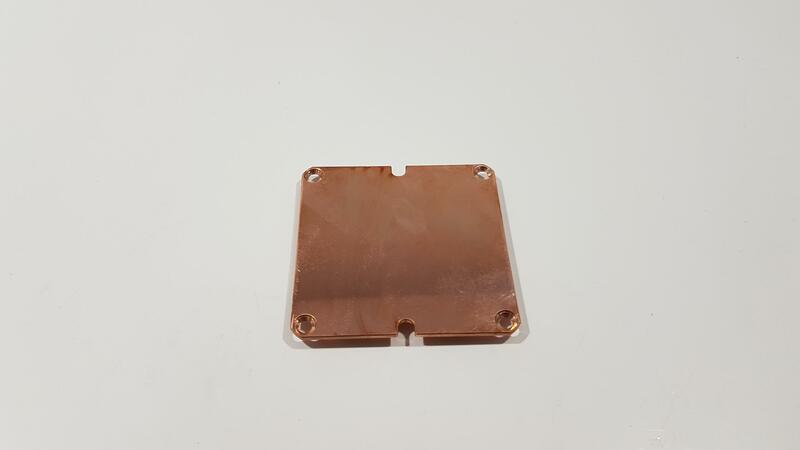 The base (cold plate) of the block has pure copper finished in mirror-like design. We could spot a bit of oxidization right after peeling off the protective sheet and in a couple of following days, there was a lot of oxidation that almost made the copper base blackish. I have no clue on what could be the source of this rapid oxidation. Maybe this is due to the protective sheet covering all of the copper base and not exposing it to the air but I am not sure and I could be wrong. Anyhow, there is nothing that an acid solution can’t handle and we gave our base a taste of lemon dipped water for some hours to get rid of the oxidation. After this treatment, we kept this base under watch for some days to see if oxidization comes back but there was no repetition afterward. To take the base off the block, we need to remove the four main screws on each of the corners. The base measures approximately less than 1.50mm thickness. A digital scale would have been helpful for more accurate measurement and it is on our wish list and will soon be purchased along with other testing equipment. Removing the copper cold plate will show the inside of the block. The top side has a thick O-ring to ensure the seal between the block and the cold plate. The frame has an angular design around the BSP G1/4” ports on both sides which are in symmetry. 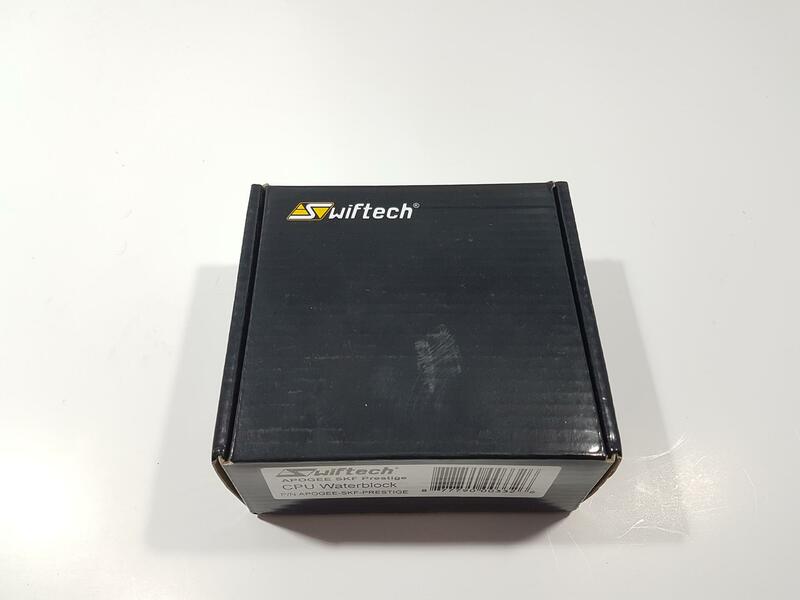 The machining work on the inside block is again of the high quality and does give us a good impression of the Swiftech’s production and design facilities. Each port has a channel forming going up to the length of that particular side. The middle portion has a raised surface as compared to the liquid channels on both sides. There is another acrylic window of the size 18x34mm in the center placed on top of black color O-ring. This window is placed right on top of the middle section of the micro-fins and a user can sport liquid flow from the top side of the block. Let’s take a look at the main ingredient of this block, the cooling engine. 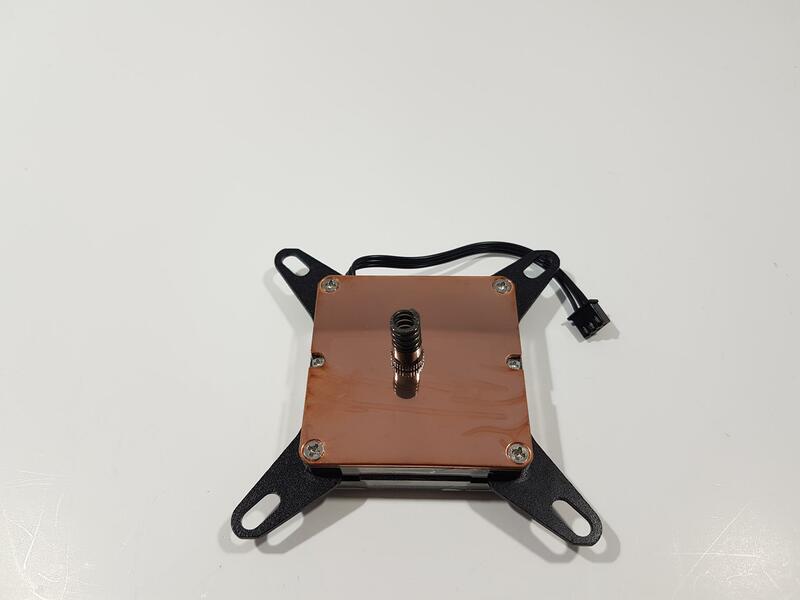 The base plate and the micro fins are made from a single copper block which is an amazing job done by the Swiftech. Cutting the copper to 125 micron thick slotted fins on a single block is a job well done indeed. Mind you, 125 micron is roughly equal to less than 5 thousandths of an inch. Mind-blowing design. Even a quick look is enough to show the much-raised height of the micro-fins stack. The base plate is measuring 56x56x1.45mm (We are not sure about the thickness but it is surely less than 1.5mm). The micro fins area is measuring 34x34x3mm where 3mm is the height of the micro-fins. 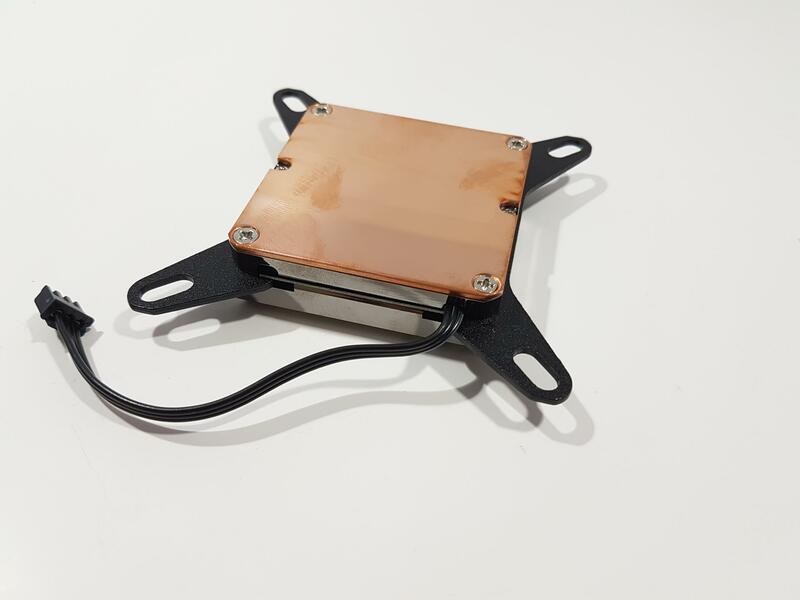 This is quite a height for the micro-fins and while this will give a lot more surface area for the heat dissipation hence better thermal performance but equally, this would make the design more liquid flow resistant which would have an impact on your pump choice decision. Generally, you would want a powerful pump with high head pressure to counter the high liquid flow resistant design of the cold plate. Each side around the micro fins stack is measuring 11mm. 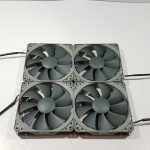 This design is making me feel like that Swiftech is definitely true in their saying that this revolutionary cooling engine is at the very least one generation ahead of the competition. I was not able to count the number of fins per row as this was too tedious a task even with a magnifying glass. The inner side of the cold plate gives us a hint of the oxidation as well. PS: Make sure to put on the O-rings while assembling the block in case you have disassembled it. 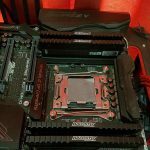 I have tested the block on Intel LGA-2011(3) socket. 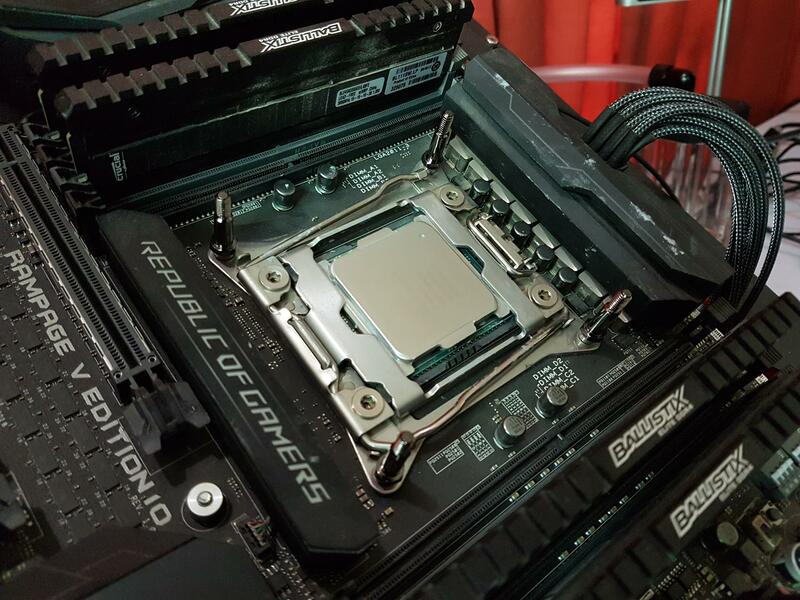 Installing any cooler on this socket is the easiest of all Intel sockets as it has a pre-installed backplate. Here is what you would need to do to install this block on this socket. 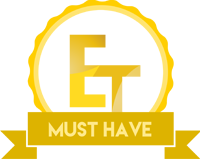 Take out the transparent container labeled Intel LGA 2011. This container has 4 screws. 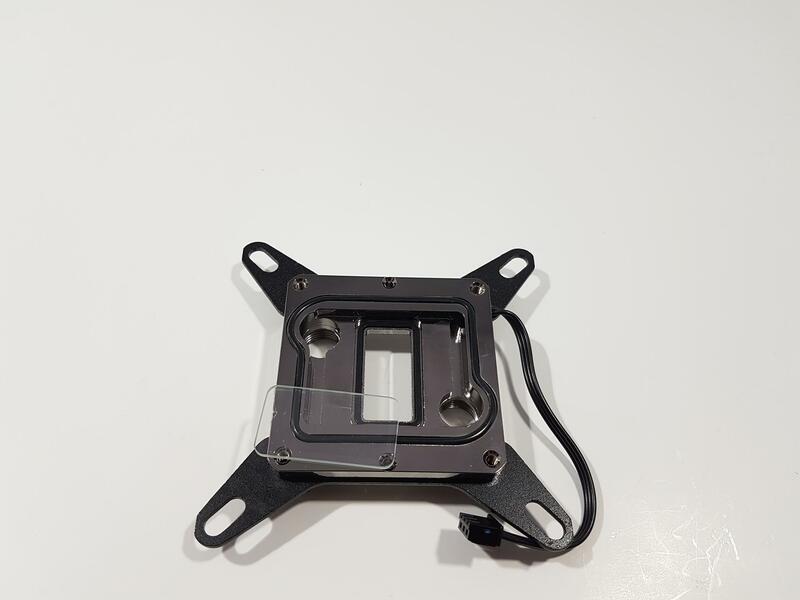 Use the side with thicker threading and install them on the four mounting holes around the CPU socket area. Next, peel of the protective sheet from the base of the block. Apply thermal paste to the CPU surface. Place the block on the CPU such that holes on the arms of the mounting brackets pass through the already installed standoff/screws. Now, take out the transparent container labeled Intel All. This has four spring-loaded nuts/screws. Put each on the LGA-2011 screws and start tightening them in a diagonal pattern. Screw them till the thread runs out. Optionally, connect the 3-pin LED cable to the Iris Eco controller hub. This would complete the installation of the block itself. Next step would be to install fittings on the ports. We have used G1/4” Compression fittings for 10/13mm from Alphacool. 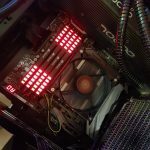 We are humbly thankful to the Alphacool for sponsoring us the open loop stuff which has enabled us to complete this review. Since at the moment we don’t have a manometer, hence we won’t be able to measure the liquid flow restriction of the block at the moment. We have a plan for other testing equipment including manometer in coming times that will enable us to do more detailed testing of the hardware at hand. 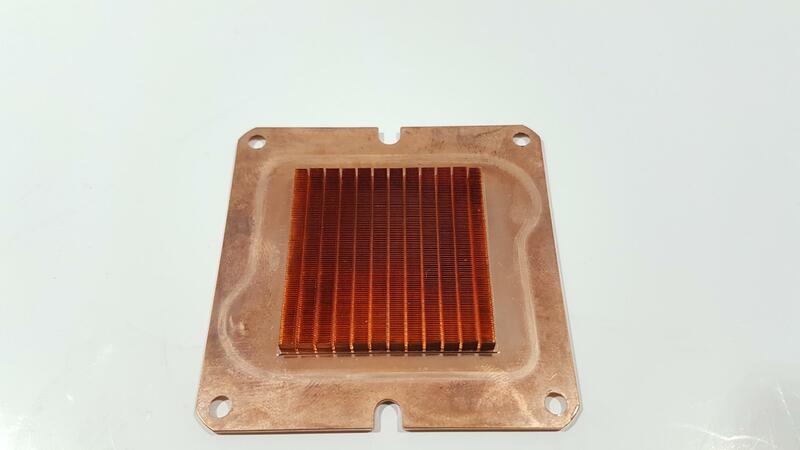 For now, we will stick to the thermal testing as this is the ultimate goal of any CPU Water Block. 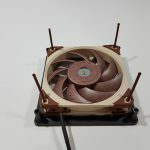 We are using Noctua NT-H1 thermal paste on our test bench to ensure the standardization among the coolers testing and to mitigate any benefit coming from the bundled thermal paste with the cooler. We are using Asus RealBench 2.44 to stress test the CPU on stock clocks of 3.6GHz at 1.130V and on an overclocked chip to 4.3GHz at 1.350V. One hour run of the test is done for each time. The average of all cores temperature readings is calculated by summing up the temperature reading of individual cores and diving this figure by the number of the cores. Then we calculate the delta temperature by subtracting the ambient temperature from the average value. Rounding is done to two decimal points. All the testing was done on Microsoft Windows 10 x64 Professional Edition. For this testing, we have used a pump at 100% and at 50% of its nominal speed. The MCP655-PWM pump has been used by the Swiftech in their D5 Maelstrom line of the reservoir/pump combo. Its nominal head is 13 ft and a maximum pressure of 50 PSI. Its speed range is 800 to 4800 RPM controllable using PWM header. On stock clocks, under stress test, the delta temperature was 18.50°C at 100% of the pump’s speed and 18.51°C at 50% of the pump’s speed. There was only 0.1°C difference clearly showing that the pump is powerful enough to drive your cooling solution using a single water block. 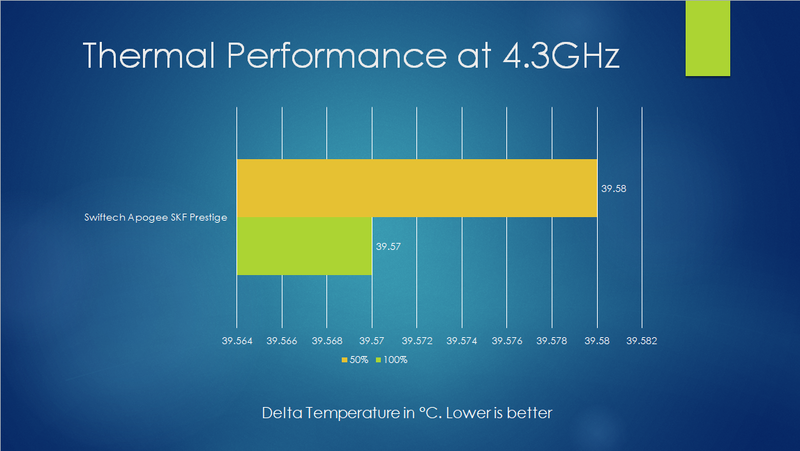 With overclocked chip to 4.3GHz using 1.350V, the delta temperature was 39.57°C at 100% of the pump’s speed and 39.58°C at 50% of the pump’s speed. 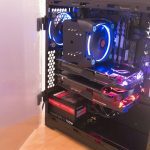 This is too good a thermal performance to speak of and clearly, Swiftech has delivered a powerful cooling engine in the Apogee SKF Prestige CPU Water Block. 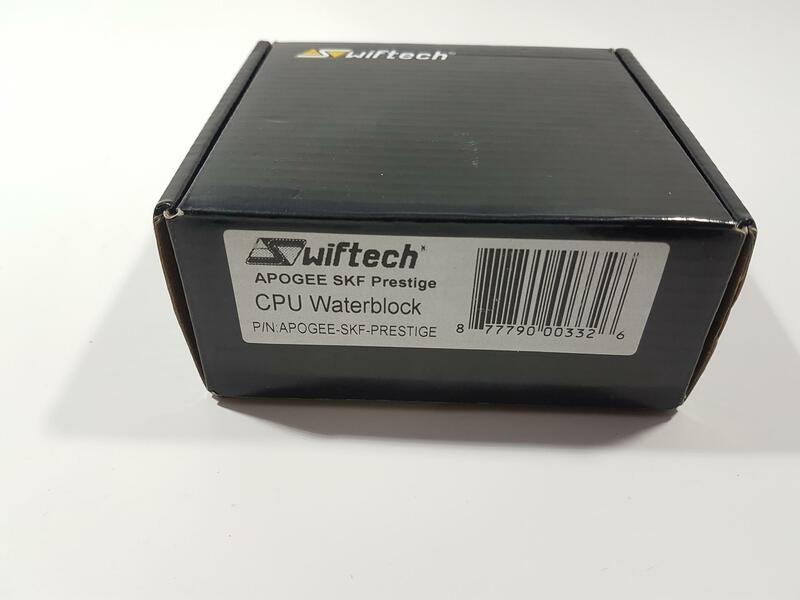 Swiftech Apogee SKF Prestige is next generation CPU Water Block employing new and powerful cooling engine. This block is constructed out of black chrome plated brass body with a silver center cover and chrome Swiftech logo. Use of brass has made this block to be quite heavy. The dimension of the block without mounting brackets is 58x58x16mm as per our calculation. The block comes pre-installed with the mounting brackets. 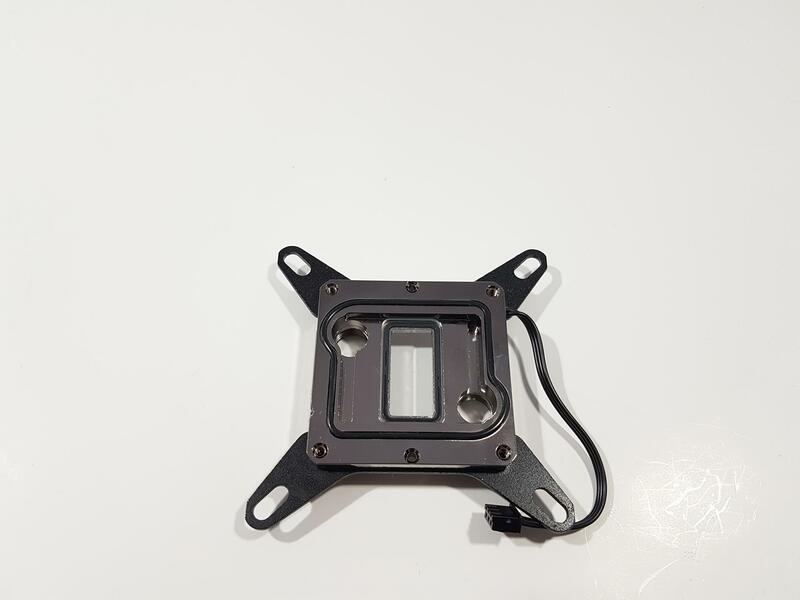 Block comes with necessary mounting hardware to make it compatible with the Intel LGA 115X, LGA 2011(3), 2066 and AMD AM2/3, AM4, SP3/TR4 sockets. Overall design elements of the block are in symmetry and look and feel is too good to be true in person. The top side of the block has two BSP G1/4” threaded ports which are not in parallel to each other but have a diagonal implementation which not gives the block maximum clearance for the large size fittings but also the makes these ports to sit in total harmony with the overall design. We have grayish tint on the two sides of the block on the top. One side has three cutouts on the top with a port at the bottom and the opposite side has the port on the top and beautifully designed and implemented Swiftech logo at the bottom. This logo is finished in Chrome with the text and symbols in the same gray tint that the raised sides have. This gives bold looks to the block. There is a recessed portion or section in the middle on the top side of the block with silver color frame sitting on top of the acrylic window. The very purpose of the acrylic purpose is to show the beautifully crafted micro fins stack. It will also show the flow of the liquid. This is not all as the top and bottom sides of the central portion have two addressable RGB LED strips. Each strip has 3 LEDs on it and being addressable they draw 5V power. There is a 3-pin LED cable coming out of the block with approximately 100mm of length. This is a short length cable and I actually like the idea behind it. In case a user does not want to use the lighting solution, there will not be a need to do a proper cable management just for this single cable as its length makes it easier to tuck. These LEDs are compatible with the Swiftech Iris Technology. Unfortunately, you would need Iris Eco controller Hub to power them on. Our attempt to power them by using a custom 5V controller was futile. Also, this particular header implementation makes the cable not compatible the addressable RGB enabled headers on the motherboards. 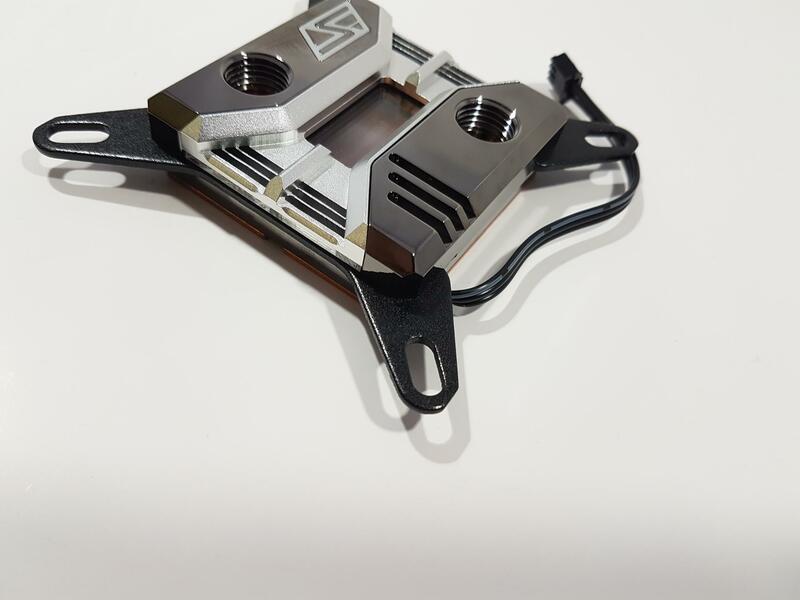 Maybe Swiftech could come up with their new generation of the water blocks making them compatible with the lighting headers on the motherboards keeping up with the industry trend. Still, this is not a complaint or a Con in my opinion hence not going to deduct any mark out of it. 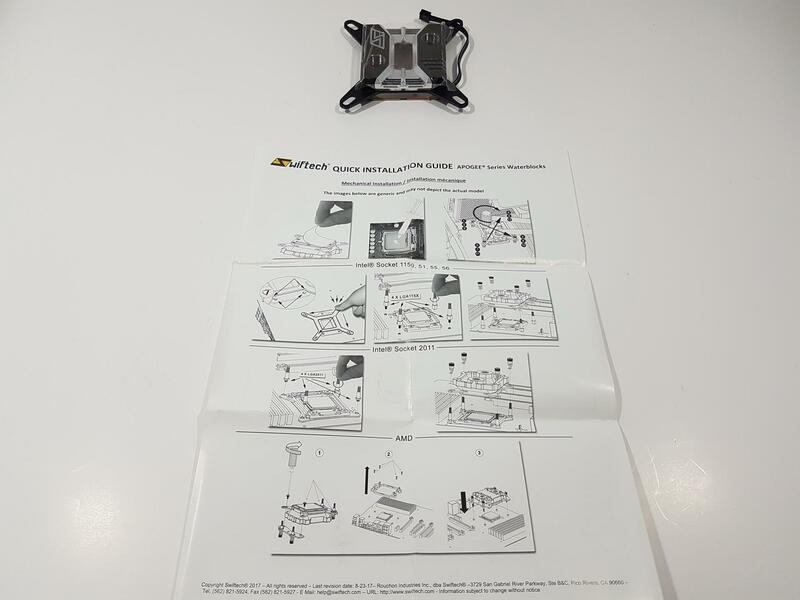 The Mounting brackets come pre-installed on the block and can be taken off. The sides of the block are designed such like we have top body part above the mounting brackets and bottom body part under them. The left and right sides have a solid finish in the middle whereas the top and bottom sides have acrylic panes above the mounting brackets. This is another area where the light diffusion will come off. The main area is on the silver frame as it has three cutouts on the top and at the bottom for this diffusion. This is indeed a well thought out design. 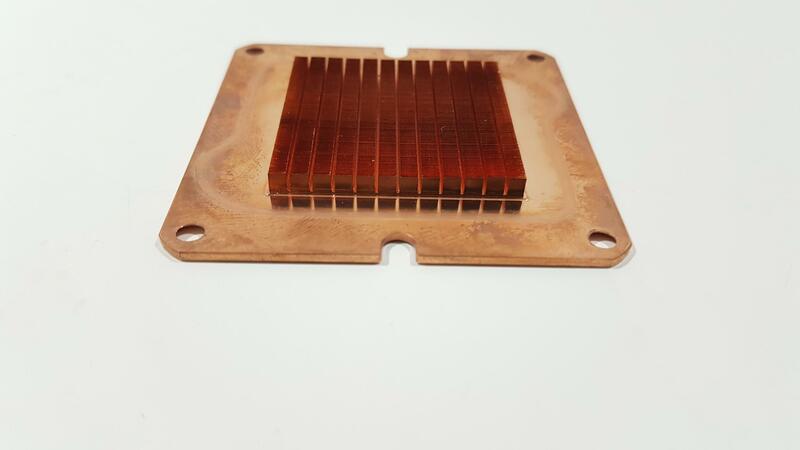 This block features an all pure copper base with the thickness of less than 1.50mm with an overall dimension of 56x56x<1.5mm. It has a mirror finishing which does look good in person. There are four screws with one on each corner of the base securing the base with the block itself. There are angular cutouts in the middle on two sides of the base with two more screws going inside. Actually, these screws are on the block’s frame not on the base itself and they are securing the silver frame and acrylic window on the top. In order to access the LEDs on the top, you would just need to remove these two screws. Little peek inside the block by removing the base will show some excellent machining and finishing inside the block. There is a grayish tint to the brass block from inside as well. We have angular rounding around the ports on the main body. Each port has a channel formed in front of them going all the way to the opposite side. There is a large size O-ring forming a good seal between the main frame of the block and base. 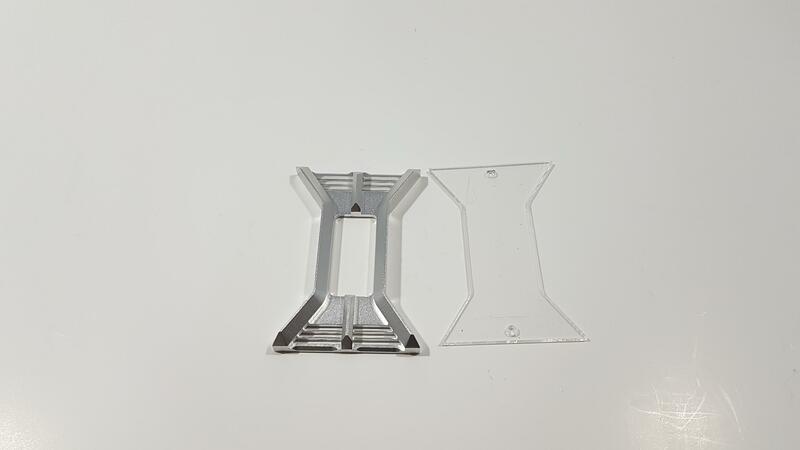 In the center, we have another acrylic window with the dimension of 18x34mm. It also has O-0ring underneath to form a seal. 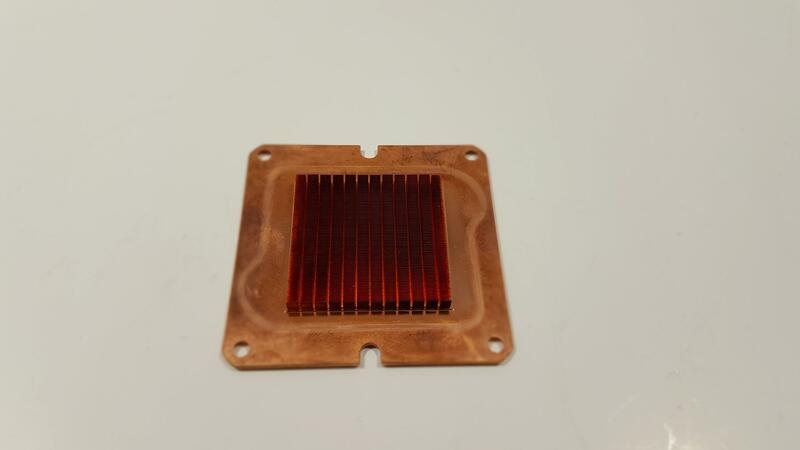 The main element of this block is the cooling engine which is made out of a single copper block with 12 rows of 125 micron thick slotted fins and to put the thing into some perspective 125 micron is less than the 5 thousandths of an inch. This is definitely a technological marvel by the Swiftech. The story does not end here as the dimension of the microfin stack is 34x34x3mm. You read it right the microfin stack has a height of 3mm which when combined with the <1.5mm of the cold plate’s thickness gives potentially much enhanced thermal heat dissipation capacity but this also gives another compelling consideration for the pump’s selection. Due to this particular implementation, this block has a high liquid flow restriction. In order to cover this aspect, you would want a pump with a higher pressure head. Also, this implementation has no split stream mechanism on the center and liquid flows diagonally from one port to other port hence there is no dedicated Inlet and an outlet port on this block. Unfortunately, I could not test the RGB lighting effects on this block due to non-availability of the Iris Eco controller hub. 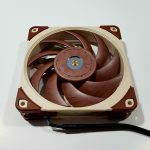 The Swiftech Apogee SKF Prestige is rated at $89.99 at the time of the review. 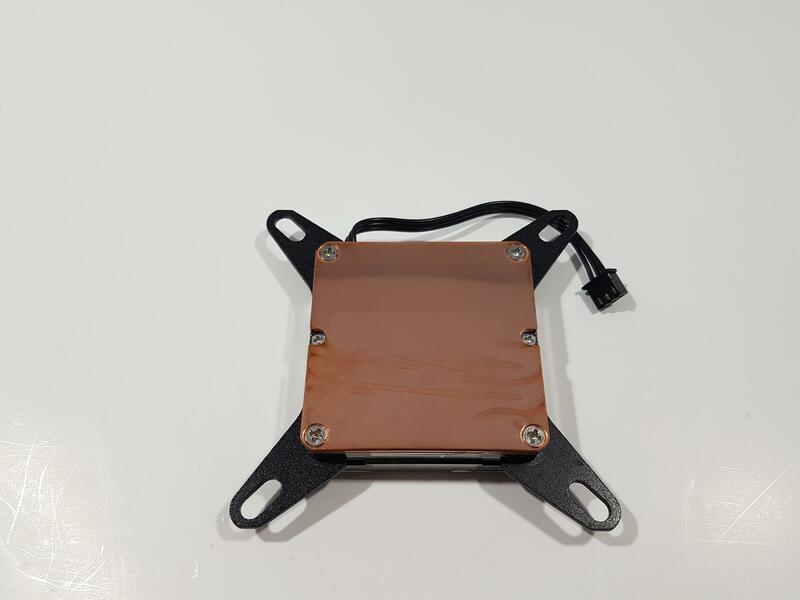 A bit high price tag but for what it is worth, this block has superior thermal performance as indicated in the Testing section on our content and further augmentation of addressable RGB LEDs makes it put forward compelling reason to have it as your heat killer. 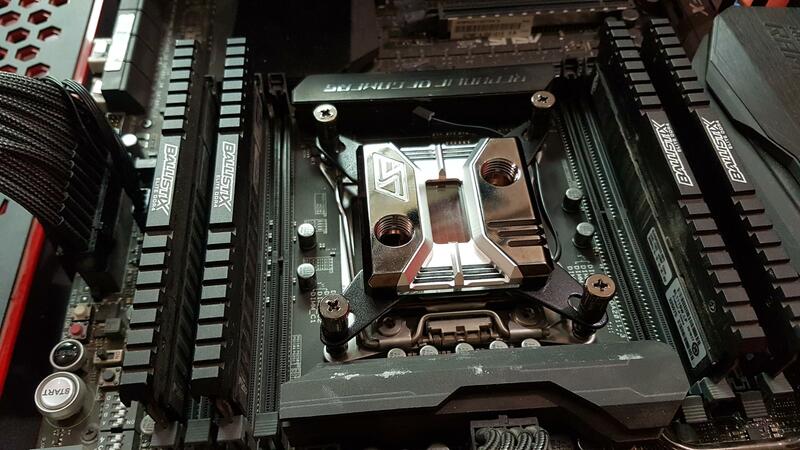 This block is the very first one on our test bench and we are surely looking forward to doing more contents of the water blocks in the coming time. The Swiftech Apogee SKF Prestige is a Must Have though don’t forget the pump consideration. 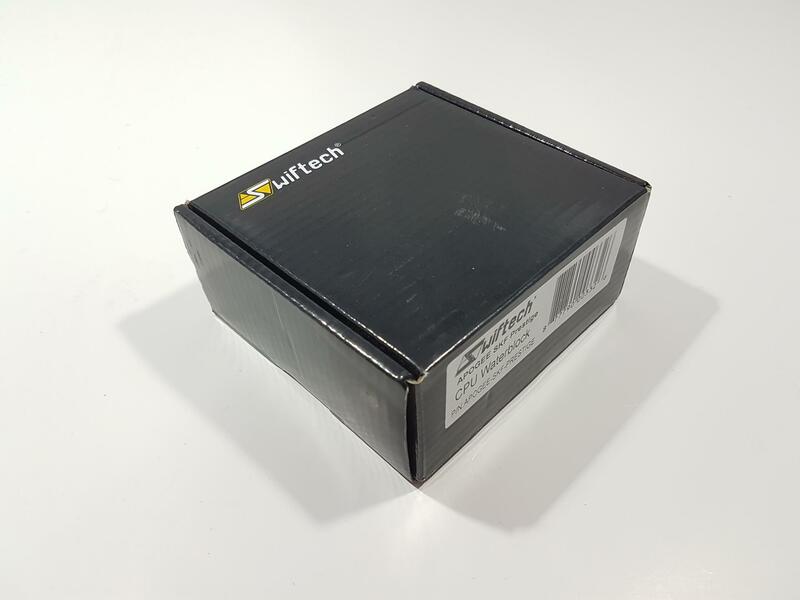 We have tested the MCP655-PWM pump from Swiftech to test this block and for understanding have included the thermal performance with the pump at 50% and at 100% speeds which do not produce any difference (just 0.1°C). This is for you to better gauge which pump to consider if considering this block for your cooling needs. I would like to extend my apology to the Swiftech as this content was supposed to be out much earlier but to regional restrictions and what not it took me some time to put it out. 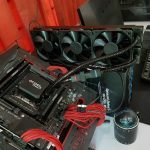 I am highly thankful to the Alphacool for sponsoring EnosTech with the open loop stuff to complete this content. 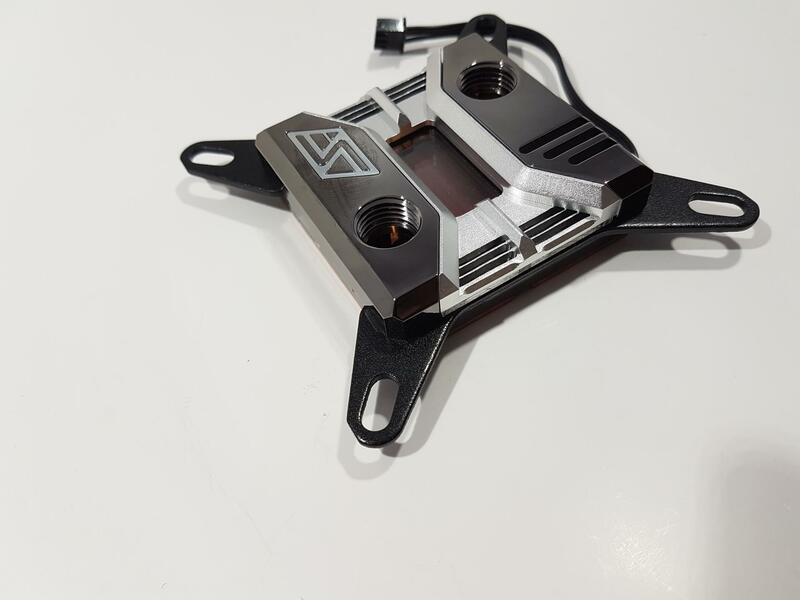 We are also thankful to the Swiftech for giving us the opportunity to review their Apogee SKF Prestige CPU Water Block.